PROVERBS 29:25 KJV "The fear of man bringeth a snare: but whoso putteth his trust in the LORD shall be safe." 22An angry man stirreth up strife, and a furious man aboundeth in transgression. 23A man's pride shall bring him low: but honour shall uphold the humble in spirit. 24Whoso is partner with a thief hateth his own soul: he heareth cursing, and bewrayeth it not. 25The fear of man bringeth a snare: but whoso putteth his trust in the LORD shall be safe. 26Many seek the ruler's favour; but every man's judgment cometh from the LORD. 27An unjust man is an abomination to the just: and he that is upright in the way is abomination to the wicked. The feare of man bringeth a snare: but who so putteth his trust in the Lord, shall be safe. The fear of man brings a snare, But he who trusts in the LORD will be exalted. The fear of man bringeth a snare; But whoso putteth his trust in Jehovah shall be safe. The fear of man is a cause of danger: but whoever puts his faith in the Lord will have a safe place on high. The fear of man bringeth a snare; but whoso putteth his confidence in Jehovah is protected. 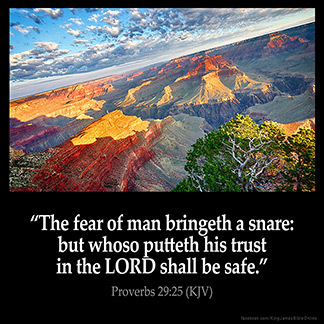 The fear of man bringeth a snare: but he who putteth his trust in the LORD shall be safe. The fear of man proves to be a snare, but whoever puts his trust in Yahweh is kept safe. Fear of man causeth a snare, And the confident in Jehovah is set on high. The fear of man bringeth a snare; but whoso putteth his trust in the LORD shall be set up on high. 29:25 A snare - Is an occasion of many sins. Very powerful. I really appreciate all the other comments, and sharing your stories. It is nice to see the Bible bring you comfort despite the challengers you have had in life. Fear of man is a tool satan has used greatly In our society. Fear of man prevents many from standing up for what is right. Fear of man cripples individuals to stand up for themselves! To conquer this fear would be a valuable asset in my life, and in my spiritual life. I know the Lord has a plan for me. I have been dealing with the snare of the lion, all of my life. Today I accept it, recognize it, pray on it, & move on. The Lord knows my heart. My joys, my fears, and my sorrows. He didn't carry me this far to leave me...Can I get an "AMEN"! I was abused by my ex-husband for many years and feared him. Proverbs 29:25 released and freed me from the years of fear. I thank God for keeping me "Safe and Free". JUSTICE IS AN AWESOME NECCESITY,i believe.IT might be a good motivater to if i think about it.